Pirates have always been popular, but have become even more so in recent years. Just ask Johnny Depp how much money he made off of his five runs as Captain Jack Sparrow. Or, ask my twelve year old daughter, who binge-watched the entire movie series. Or ask any of the thousands of kids who have made pirate costumes consistently in the top ten Halloween costume list year after year. Pirates have a cool, adventurous romanticism about them that brings out the kid in all of us. According to some, the true nature of pirate history may not be as romantic, glorious or even as action-packed as is popularized in the movies. But it sure is fun to daydream about it sometimes, right? How would you like to know of a secret place you could go, where pirates used to hang out? I’ve been to a place like that. It’s a small inlet called Flamingo Pond, on an island in the Caribbean called Water Island. At less than one square mile, Water Island is the smallest, newest and least known of the US Virgin Islands. 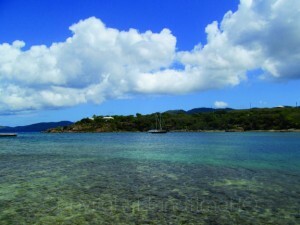 It sits just south of Crown Bay, across the Gregerie Channel from Saint Thomas. A five minute ferry ride from Crown Bay Marina gets you to the island in no time. Once there, you take a proverbial small step back in time. 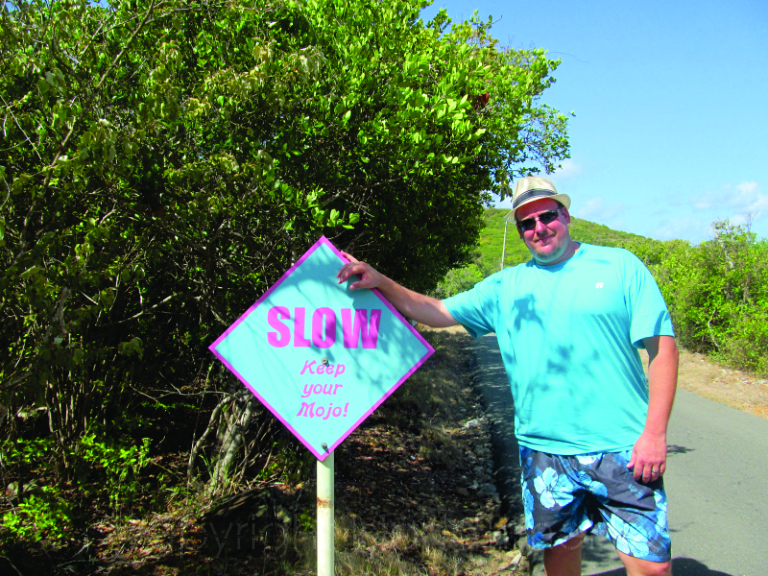 There are a couple of beach bars to grab a bite to eat, swim and play on Honeymoon Beach, a few places to spend the night (see my review of the Virgin Islands Campground) and, well, that’s about it. 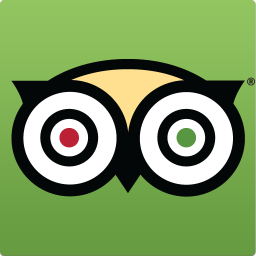 There are no fancy sit-down restaurants, no hotel chains (yet), and not even a souvenir shop. There aren’t any stores on the island at all. Not even a McDonalds! Andrea and I like the idea of getting away and finding a place to completely relax. Between the two of us, we have four kids as well as two jobs each, plus a decent sized house, two cars, and all of the other responsibilities of life. When we get the chance to get away as a couple, we love to “just chill”. We aren’t big partiers or the type to go to the club. If you are, that’s cool, and we hope you have fun. As for us, though, we’re always looking for an opportunity to see some cool things, maybe take in some music, possibly learn something, but most of all, just get some down time. In many ways, Water Island met this and then some. While on island, we rented a golf cart (one of the few businesses on the island) and went exploring to see what we could find. We found our way up and down every public road on the island in only a few hours. (Told you it’s small!) We saw some beautiful homes, and some not-so-beautiful ones as well. Just as with all Caribbean islands, you have both ends of the financial spectrum. We did try (unsuccessfully) to find our way into the ultra-exclusive Sprat Bay section of the island, a gated community on the East end. We did see some these homes from the other side, on a cruise we took around the island, and they are fantastic! 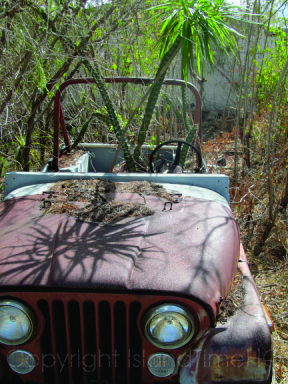 We also found houses and apartments of all different sizes, quite a bit of new housing construction, the island’s dump, an automotive graveyard and, one of my favorites, an abandoned jeep with a cactus growing inside of it. The sights around the island are kind of eclectic. There is really a little bit of everything to see. In fact, there is even an abandoned military installation that most people have never heard of. Who would have thought such a tiny island that no one knows would actually be home to a military installation? 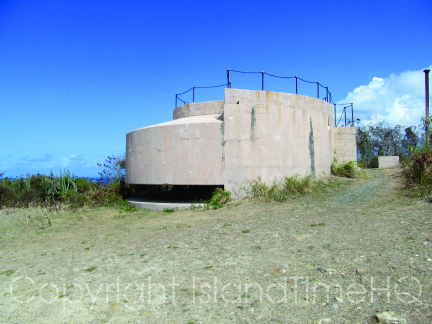 Interestingly, Water Island’s southern geographic location (relative to St. Thomas) and open view of the Caribbean Sea made it an ideal location for the installation of a military observation point to protect the World War II submarine base located in St. Thomas. In 1944, the United States Department of Defense acquired Water Island and started the construction of Fort Segarra, a bomb-proof underground facility, lookout tower and gun station. The end of the war in 1945 led to the the DoD ceasing construction of the site before it was finished. Here is an article with more information on the military history of Water Island if you’d like to read further, and here are pictures of the island taken by servicemen during the 1940s. is it to see a half-completed military base that almost no one has ever seen? Well, to be honest, you can tell that it as been seen by local island teens, based on the trash and beer bottles disposed of down the entry hatch from above, but it was still an interesting experience nonetheless. On the winding road up the hill to top, you pass the “side entrance”, which is literally an entrance cut into the side of the hill. Once you get to the top, you can see the observatory originally intended for soldiers to survey the southern view of the Caribbean Sea, and climb the steps to the top, where the views are nothing short of breathtaking. No description of Water Island would be complete without mentioning Honeymoon Beach. In the future, I’ll write a post dedicated to Honeymoon beach, but the short of it is, this is the main entertainment venue on on island, and for those looking for an opportunity to do nothing but chill, it definitely delivers. This small, man-made beach has two bar/restaurants that play music, some beach chairs, crystal clear water, and a heaping dose of relaxation. The Water Isle Hotel, also known over the years as The Water Isle Colony Club, Sugarbird Hotel and the Sea Cliff Hotel, was a popular tourist location from 1953 until Hurricane Hugo completely destroyed it in 1989. In recent years, even the ruins have been mostly cleaned up. All we could find on our journey was the former tennis courts, now overgrown with island foliage. The good news is, some of the locals told us that the governor was trying to rebuild the hotel, and in November 2014, a lease was signed with the Water Island Development Company to rebuild the hotel into a “boutique resort”. As with any island in the Caribbean, many of the folks on Water Island could use the jobs. I can’t wait to see what comes of this, and look forward to visiting once construction is complete! During our travels, we eventually did end up at Flamingo Pond. This is where the piracy comes into our story, as well as the name of Water Island itself. Why would they call the island “Water Island” in the first place? No, it’s not because it is surrounded by water. If that was the case, they’d all be called Water Island, right? Actually, Water Island has (or actually, used to have) a unique feature. In the middle of the island was a fresh water lake called Flamingo Pond. The story goes that hundreds of years ago, during the Golden Age of Piracy, pirates would stop at Water Island and refill the water stores on their ships from Flamingo Pond, hence the island’s name. In the 1960s, a channel was cut into the island, connecting Flamingo Pond to Flamingo Bay. This merged the formerly isolated fresh water lake with the salty ocean water, giving ships a safe harbor from storms. While the water is no longer an isolated fresh water lake, it is still cool to stop by and stand at the water’s edge, imagining those who came before you. Stories of pirates are often over-romanticised with adventure, buried treasure, and other tales of folklore. Nevertheless, it is fun to get your feet wet imagining the hands of buccaneers reaching down and cupping the same water to take a sip. Ralph Waldo Emerson is known for saying that life is the journey, not the destination. By making Water Island our destination and taking a journey around the island, I think we did Mr. Emerson proud. By reading this, you’ve joined the short list of people who even know the island exists. Maybe you’ll get the opportunity to stop by and visit, even if it’s a cruise ship excursion to Honeymoon Beach from the port at St. Thomas. If you do, pause for a minute to imagine Captain Jack Sparrow standing in a row boat as he directs his crew towards the same beach where the Phillip’s Landing Ferry Dock now stands. Imagine some unnamed, 17th century crew member planting his feet for the first time in the same soil you stand in on Honeymoon Beach. And then be sure to stop by one of the beach bars for a bit of rum and do your inner pirate proud!